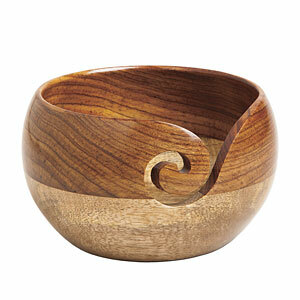 Place your yarn in this lovely two tone rosewood bowl and keep it from running away. A spiral cutout holds your working yarn securely, and the spherical shape helps keep the ball inside with a pleasing, organic form. The pale tropical mango wood is prized for its dramatic woodgrain and variation in tone and texture, which creates a stylish contrast with the more uniform, deep-hued Indian rosewood. This is a tapered bowl with an opening diameter of 5 inches and a middle bowl diameter of 6 inches. Please note: as a natural product, appearance will vary from item to item. I have a issues with the function and appearance of this bowl. Most importantly, I feel the edges of the scroll are sharp and will cause friction on the yarn as it is pulled through. Friction = yarn enemy. Second, the mango wood is blonde AND black. It looks like someone rubbed a black stain in various places all around. It looks dirty, not pretty. KnitPicks kindly sent another bowl in case the first one was a fluke, but that one had the same issues so I'll be returning it. I hate to be negative, especially because I love so many other KnitPicks products! Very happy with my bowl purchase. I've graduated into more (elite?) yarns and this is perfect. I've seen them in some stores at double the price so for me it's a great value and gift to myself. Beautiful gift from my granddaughter. A lovey work of art and sooo functional. I'm so happy with this purchase! The bowl itself is a work of art and very well made. You'll never have to worry about your yarn catching. To top it off this is the best price I've found so far. A birthday gift from my husband, I couldn't wait to use it. Its a stunning bowl! The yarn glides along without a hitch and each time I crochet I am amazed by the beauty of the wood. I am thinking of getting another!